Charles Goren was right. As early as the mid-1950s he was urging bridge players to avoid getting caught up in all the trendy new bidding systems with their myriad confounding conventions. Eventually, even the great Goren was dragged screaming and kicking into the new age of scientific bidding, allowing that things like the Blackwood ace-asking convention and the artificial 2C Stayman bid to check for a 4-4 major suit fit after a 1NT opening bid could be useful at times. But in fighting against complications to our great game of contract bridge, Charles Goren was right. As I write this introduction in the later half of 2008, contract bridge is dying in America, despite feverish attempts to revive it with Easybridge, Mini Bridge, the School Bridge League, "Bridge Is Cool", collegiate tournaments, targeting of AARP members, creation of new masterpoint categories to stimulate continued play, Internet play, etc. Membership in the bellwether American Contract Bridge League (ACBL) is static, with only about a 1% growth rate at present. Bridge playing in the general population (non-duplicate players) is static to negative as well. Something drastic must be done if contract bridge is to survive as a popular, dynamic game. This ebook is a step in that direction. In its present form bridge is just too hard to learn. It takes years to develop the ability to confidently play the game with experienced players. For that reason, the ACBL has flighted, stratified, and segregated players by masterpoint category, and the vast majority of players think such an abomination is a wonderful thing for the game, because it keeps them "competitive" within their comfort zone. They would rather win than improve, continually beating up on the minnows and avoiding the shark tank. Me, I'm a minnow with an attitude - I swim with the sharks, baby, and if they chew me up I don't let them swallow me. But I realize I'm in a very small minority of hard heads. Most folks give up and find some other leisure activity. We can't have that. Does our approach preclude playing in club and tournament games? No. But if the Simplicity Bridge system is used by Simplicity System players, they should run circles around the non-Life Master category folks who constantly get in bidding trouble and mis-defend due to having signals crossed. It is recommended, however, that Simplicity players initially concentrate in International Match Point (IMP) events rather than matchpoints. Once familiar with opposing systems and conventions (which we describe in Chapter 8), and with a lesson or two on matchpoint strategy vs. rubber bridge oriented scoring then this system should be competitive at matchpoints as well. This ebook teaches the basic elements of contract bridge in a fun, safe, and easy way. It is designed for play in college student unions, coffee shops, bars, kitchens, dens, break rooms, and any other place where folks gather and have a half hour or so to get in a rubber. It is best played for money, even if very low stakes like a tenth of a cent a point. Playing with money at stake (yours and a partner’s!) tends to increase concentration. I close this with a request for your indulgence. I have a personal prejudice against using suit symbols for spades, hearts, diamonds and clubs in hand diagrams. I find them distracting. If that bothers you, feel free to draw them in. 1st edition 2009; 165 pages. Chapter 3: Hey, They're Fighting Back, No Fair! If bridge is going to survive as a recreational activity, it will be saved by Chris Hasney and visionaries like him. Chris successfully teaches someone who literally does not know the difference between a spade and a heart how to play winning bridge in one hundred sixty-three pages. He uses language a non-bridge player can understand. He instills a sense of fun into the entire process by using terms such as "Monster Mash" to describe hands with freak distribution. He lists and elaborates on almost every element of bidding, declarer play and defense that a new player will need to master in order to be successful and does so efficiently and with flair. Not only that, but, at the end of each chapter, he suggests a bibliography which is divided by tiers of difficulty and sophistication. Chris' target audience is the non-bridge player who wants to learn how to play bridge. This hypothetical player could be young or old. He could have interest in tournament play or his interest could be limited to home or club play. Chris is not trying to save tournament duplicate bridge. He is attempting to save the game of bridge itself, without the trappings of master points or trophies. This no-nonsense and simplistic (hence the name) approach to teaching the game is just what the doctor ordered. But don't think Chris' discussions of vital subjects such as slam bidding, defensive carding and declarer plays such as squeezes are cursory. Although they may not be able to immediately completely comprehend them, he is able to delve into the finer points of the game in a way that enables novices to appreciate their beauty and availability. I'm not greatly familiar with e-books and their format, but Simplicity Bridge could have been aided by improved graphics. Chris uses several tables which help explain concepts, but they are somewhat stark and geeky at times. 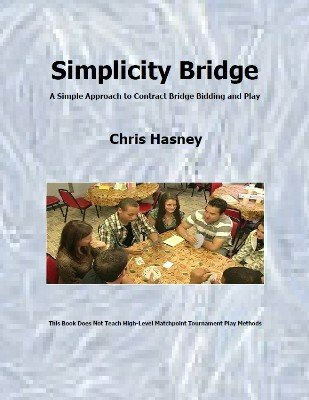 If your life depended on teaching someone how to be a good bridge player within a limited amount of time, Chris Hasney's Simplicity Bridge would be your magic bullet.